For many pets, Halloween is a holiday where they can join in on the fun. Whether it is dressing up in matching costumes or accompanying the kids for trick or treating, dogs can certainly enjoy this day. Not every pet will find the fun in wearing a hotdog costume though, so here are a few tips when celebrating the candy holiday. 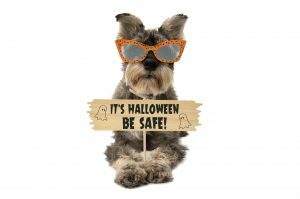 Keep your candy or chocolate away from your dog. It is common knowledge that dogs can’t have chocolate, but if you leave your bucket of goodies too close to their reach, your Halloween might be ruined. For more information about why chocolate is a firm “no” check out our blog on the subject here. Be sure to keep all of the delicious candy out of snouts’ reach. You can certainly provide your pet with an animal-safe treat or two. Halloween really isn’t dangerous, but you should be cautious. Decorations can look like fun toys to animals. If you put up streamers for any party, your dog or cat might see it as an exciting object. Unfortunately, if they choose to eat these decorations it can lead to choking and vomiting. Cobwebs and glowsticks will also pose a threat. If you choose to dress up with your pet, choose a costume with care. This means picking out an outfit that fits your animal comfortably. Make sure the costume doesn’t restrict movement, hearing or vision. Keep an eye on your pet. It is best to keep your animal inside because of the chaos going on. Dogs can easily get lost on nights like these. With all the lights and decorations, they may be scared by the amount of excitement going on. Be mindful of jack-o-lanterns. Curious cats might find these lit objects interesting if left within their reach. Objects can easily be knocked over and start a fire or burn your pet. Try using an electric candle as a substitute to be safe. While it seems like a lot can go wrong, Halloween is a great holiday for any pet-friendly household. Just use a little bit of thought and care to ensure the spooky day is also a safe day.